When will the Government fix the social care crisis? The Government still hasn’t published its plan to improve social care. This delay is costing older people the care and dignity they deserve. 700 days ago the Government announced it would publish a Green Paper on social care. But since then it’s been delayed 6 times. In those 700 days, more than 54,000 older people have died waiting for their care to begin. We need the Green Paper now, so that we can stop older people in the UK struggling on without the help they need. The state of social care in the UK is costing the NHS £500 a minute. And it’s leaving 1.4 million older people without the care and support they desperately need. Find out more about our Care in Crisis campaign and how you can help. 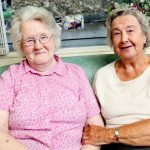 Sorting out social care for a loved one can be a real challenge. But we’ve got lots of resources to help you through the process, and people at the end of the phone or in your area who can support you. Caring for someone you love when they’ve become ill or disabled is really tough. If you’re going through that, we’re here for you. We’ve got advice, support and resources that can help you through. Make sure you, your older friends and relatives are staying warm and well in the cold weather. We’ve got tips on staying healthy and happy when the weather’s bad, and managing your finances to make heating your home that little bit easier.